Thank you to my colleague Omar Lari for this blog on how to create a continuous deployment pipeline for Kubernetes! You can use Kubernetes and AWS together to create a fully managed, continuous deployment pipeline for container based applications. This approach takes advantage of Kubernetes’ open-source system to manage your containerized applications, and the AWS developer tools to manage your source code, builds, and pipelines. This post describes how to create a continuous deployment architecture for containerized applications. It uses AWS CodeCommit, AWS CodePipeline, AWS CodeBuild, and AWS Lambda to deploy containerized applications into a Kubernetes cluster. In this environment, developers can remain focused on developing code without worrying about how it will be deployed, and development managers can be satisfied that the latest changes are always deployed. For a more information, see “Practicing Continuous Integration and Continuous Delivery on AWS”. How can you use continuous deployment with AWS and Kubernetes? You can leverage AWS services that support continuous deployment to automatically take your code from a source code repository to production in a Kubernetes cluster with minimal user intervention. To do this, you can create a pipeline that will build and deploy committed code changes as long as they meet the requirements of each stage of the pipeline. AWS CodePipeline. AWS CodePipeline is a continuous delivery service that models, visualizes, and automates the steps required to release software. You define stages in a pipeline to retrieve code from a source code repository, build that source code into a releasable artifact, test the artifact, and deploy it to production. Only code that successfully passes through all these stages will be deployed. In addition, you can optionally add other requirements to your pipeline, such as manual approvals, to help ensure that only approved changes are deployed to production. AWS CodeCommit. AWS CodeCommit is a secure, scalable, and managed source control service that hosts private Git repositories. You can privately store and manage assets such as your source code in the cloud and configure your pipeline to automatically retrieve and process changes committed to your repository. AWS CodeBuild. AWS CodeBuild is a fully managed build service that compiles source code, runs tests, and produces artifacts that are ready to deploy. You can use AWS CodeBuild to both build your artifacts, and to test those artifacts before they are deployed. AWS Lambda. AWS Lambda is a compute service that lets you run code without provisioning or managing servers. You can invoke a Lambda function in your pipeline to prepare the built and tested artifact for deployment by Kubernetes to the Kubernetes cluster. Kubernetes. Kubernetes is an open-source system for automating deployment, scaling, and management of containerized applications. It provides a platform for running, deploying, and managing containers at scale. Developers commit code to an AWS CodeCommit repository and create pull requests to review proposed changes to the production code. When the pull request is merged into the master branch in the AWS CodeCommit repository, AWS CodePipeline automatically detects the changes to the branch and starts processing the code changes through the pipeline. AWS CodeBuild packages the code changes as well as any dependencies and builds a Docker image. Optionally, another pipeline stage tests the code and the package, also using AWS CodeBuild. The Docker image is pushed to Amazon ECR after a successful build and/or test stage. 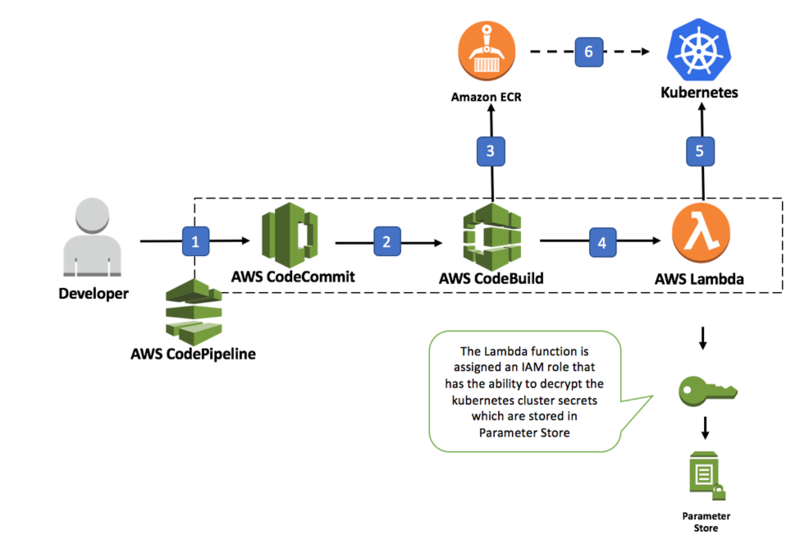 AWS CodePipeline invokes an AWS Lambda function that includes the Kubernetes Python client as part of the function’s resources. The Lambda function performs a string replacement on the tag used for the Docker image in the Kubernetes deployment file to match the Docker image tag applied in the build, one that matches the image in Amazon ECR. After the deployment manifest update is completed, AWS Lambda invokes the Kubernetes API to update the image in the Kubernetes application deployment. Kubernetes performs a rolling update of the pods in the application deployment to match the docker image specified in Amazon ECR. The pipeline is now live and responds to changes to the master branch of the CodeCommit repository. This pipeline is also fully extensible, you can add steps for performing testing or adding a step to deploy into a staging environment before the code ships into the production cluster. We are excited to see how you leverage this pipeline to help ease your developer experience as you develop applications in Kubernetes. You’ll find an AWS CloudFormation template with everything necessary to spin up your own continuous deployment pipeline at the CodeSuite – Continuous Deployment Reference Architecture for Kubernetes repo on GitHub. The repository details exactly how the pipeline is provisioned and how you can use it to deploy your own applications. If you have any questions, feedback, or suggestions, please let us know!